What you wear and how you look does matter! Always err on the side of professional and consider wearing a suit, but make sure whatever you wear is clean and wrinkle-free. Furthermore, make sure your hair is tidy, shoes are neat and accessories are conservative. If you look polished, your interviewer will remember you thusly. When we get nervous, it’s easy to look at the ground to collect ourselves. Do your best to avoid this! Make eye contact with your interviewer as you’re introducing yourself, as this conveys your confidence and excitement for the opportunity. Smiling is more powerful than people tend to think. Smiles communicate openness and eagerness – two things hiring managers like to see in their interviewees! When the hiring manager introduces him/herself, reach out and shake his/her hand without hesitation. 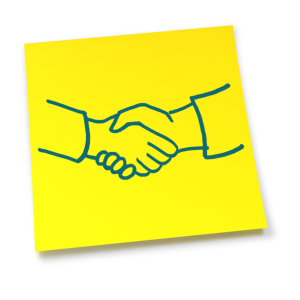 The good, ol’ fashioned firm handshake will never go out of style when making a first impression! Finally, arriving to an interview prepared is essential. Bring copies of your resume, a pen, notepad and portfolio of your work (if applicable to your industry). Also, make sure you’re prepared with knowledge about the company and position, so you can better engage in conversation and ask thoughtful questions. Yes, first impressions are intimidating, but confidence and preparation will go a long way at the beginning of your interview. Keep this advice in mind, and you are certain to begin your job interview on the right foot. Have an additional tip for making a solid first impression at a job interview? Leave us a comment! This entry was posted in Job Seekers and tagged first impression at a job interview, First Impressions, Making a Good First Impression, Professionalism. Bookmark the permalink.